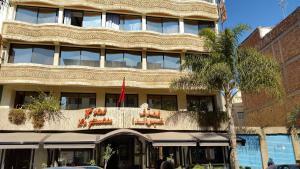 يمكنك اكتشاف المغرب بطريقة مختلفة فقط على مسافة 40 كم من مراكش، وتقع مزرعة الضيوف الجميلة على مرمى حجر من بحيرة Lalla Takerkoust والسد.يوفر هذا العقار منازل ريفية بين أشجار الرمان وأشجار الزيتون وبقع الخضروات.تعد هذه المزرعة العاملة مثالية لاستكشاف الريف المغربي، وبالإضافة إلى المحيط الرائع، يمكنك التمتع بالمسبح والحمام التقليدي للاسترخاء.بالنسبة للحجوزات لـ 3 ليال أو أكثر، تكون خدمات النقل من مطار مراكش مشمولة في سعر الغرفة. 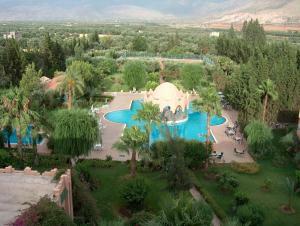 In an olive grove at the foot of the Middle Atlas Mountains, this 4-star hotel is 12 miles from Beni Mellal. 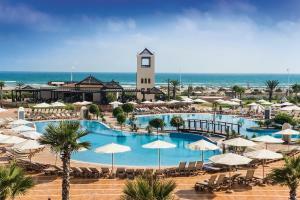 It features 2 swimming pools, a nightclub and a spa with a hammam (Turkish bath). 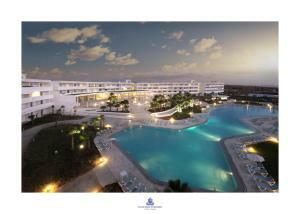 Satellite TV and a minibar are provided in the air-conditioned rooms and suites. 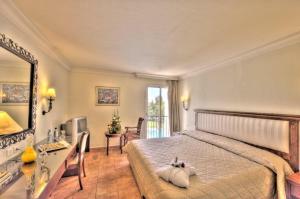 Each room features a balcony with a view of the grounds or the swimming pool. 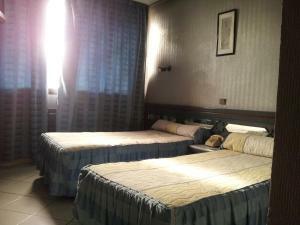 Some rooms also have a separate living room. 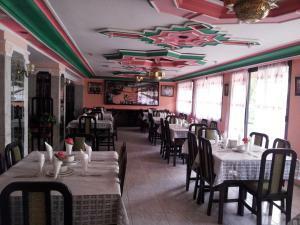 Moroccan and international dishes are served in the restaurant at Chems Le Tazarkount. 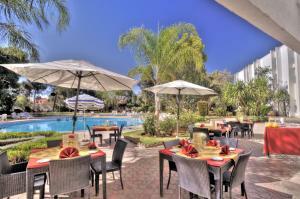 Themed evenings are organized in the bar and there is a snack bar by the pool. Free Wi-Fi access is provided in public areas of the hotel, and guests can request beauty treatments and massages at the spa. 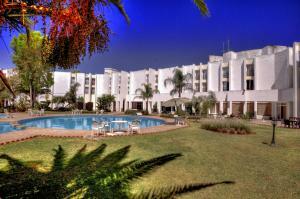 The hotel also has 2 tennis courts. Marrakech is 106 miles away. Activities in the local area include horseback riding and mountain biking. يوجد هذا الفندق ذو الـ4 نجوم في بستان للزيتون عند سفح جبال الأطلس المتوسط، ويقع على بعد 20 كم من بني ملال. ويتميز بمسبحين وملهى ليلي وسبا مع حمام تقليدي.يتوفر تلفزيون مع قنوات فضائية وميني بار في الغرف والأجنحة المكيفة. وتوفر كل غرفة شرفة مطلة على الحديقة أو المسبح. كما تحتوي بعض الغرف أيضاً على غرفة معيشة منفصلة.يتم تقديم أطباق مغربية وعالمية في المطعم بفندق Chems Le Tazarkount. كما يتم تنظيم أمسيات ذات طابع خاص في البار وهناك مطعم للوجبات الخفيفة بجانب المسبح.يتوفر اتصال مجاني بالواي فاي في المناطق العامة بالفندق، ويمكنكم طلب علاجات تجميل ومساج في السبا. ويضم الفندق أيضاً ملعبين للتنس.تقع مراكش على بعد 170 كم. وتشمل الأنشطة في المنطقة المحلية جولات الدراجات الجبلية وركوب الخيل. Located in the heart of Salé's medina, just a 15-minute walk from the beach, this riad offers air-conditioned rooms and a rooftop terrace with views of the ocean. 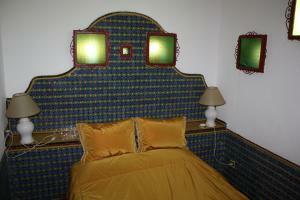 The riad has a traditional Moroccan décor with mosaic tiles. 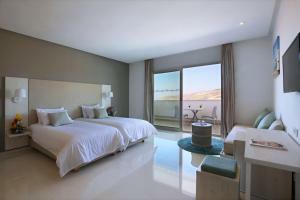 Guest rooms at the Dar El Mouhit are spacious and feature antique furniture. 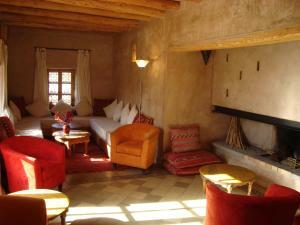 They each have a private bathroom with a shower and some of the rooms overlook the riad?s terrace. A continental breakfast is served each morning at Dar El Mouhit and upon request guests can also enjoy a traditional Moroccan dinner served in the riad?s dining room. The riad offers an interior courtyard, which leads on to several Moroccan-style salons where guests can relax in the evening. 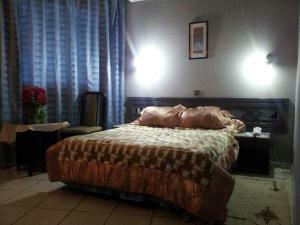 One of the salons has satellite TV and free Wi-Fi is available throughout the riad. Salé Train Station is a 5-minute drive away. يقع هذا الرياض في قلب مدينة Salé، على بُعد 15 دقيقة سيرًا على الأقدام من الشاطئ، ويوفر غرفًا مكيفة وتراسًا على السطح يوفر إطلالات على المحيط، ويتميز الراض بديكور مغربي تقليدي مع بلاط الفسيفساء.غرف الضيوف في رياض Dar El Mouhit فسيحة وتتميز بأثاث عتيق، وتشتمل جميعها على حمام خاص مع دُش وتطل بعض الغرف على تراس الرياض.يتم تقديم وجبة فطار كونتيننتال كل صباح في رياض Dar El Mouhit، كما يمكن للضيوف الاستمتاع بوجبة عشاء مغربية تقليدية يتم تقديمها في غرفة تناول الطعام بالرياض عند الطلب.يضم الفندق ساحة فناء داخلية، والتي تؤدي إلى العديد من الصالونات المُصممة على الطراز المغربي حيث يمكن للضيوف الاسترخاء في المساء، ويشتمل أحد الصالونات على تلفزيون مع قنوات فضائية وتتوفر خدمة الواي فاي المجانية في جميع أنحاء الرياض.تبعُد محطة Cannes للسكك الحديدية مسافة 5 دقائق بالسيارة. 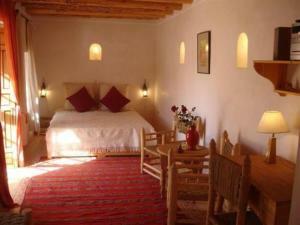 Chez Larbi Ourika is situated in the Ourika Valley, at the foot of the Atlas Mountains. 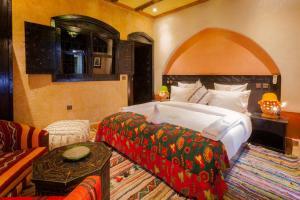 Rooms combine Moroccan and Berbère styles and offer a private bathroom, satellite TV and free Wi-Fi. Guests of Chez Larbi Ourikacan enjoy Moroccan specialities in the hotel restaurant, or on the floral terrace. 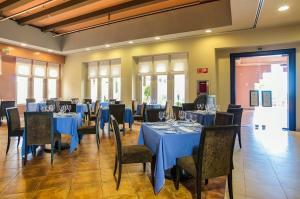 Guests can also choose from a large selection drinks, including Moroccan wines. Breakfast is available every morning. Set in a village and built from local stones, Chez Larbi Ourika offers tea throughout the day, served in the hotel garden and terrace, which offers panoramic mountain views. Oukaimeden ski station is just 30 km from Chez Larbi Ourika and guests can enjoy hiking in the countryside as well as guided tours of the mountains. 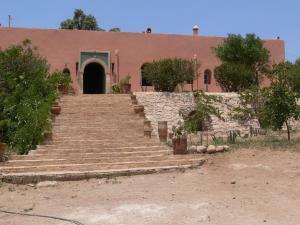 يقع Chez Larbi Ourika في وادي أوريكا، عند سفح جبال الأطلس، وتجمع الغرف بين الأسلوبين المغربي والبربري، وتحتوي على حمام خاص وتلفزيون مع قنوات فضائية، كما توفر خدمة الواي فاي المجانية.يقدم Chez Larbi Ourikacan للضيوف المأكولات المغربية في مطعم الفندق أو شرفة الأزهار، ويمكن للضيوف أيضاً الاختيار من بين مجموعة كبيرة من المشروبات، بما في ذلك النبيذ المغربي، وتتوفر وجبة الإفطار كل صباح.يقع Chez Larbi Ourika في قرية وقد تم بناؤه بالحجارة المحلية، ويقدم الشاي طوال اليوم في حديقة وتراس الفندق، ويوفر إطلالات بانورامية على الجبال.تقع محطة أوكايمدن للتزلج على بعد 30 كم فقط من Chez Larbi Ourika، ويمكن للضيوف الاستمتاع بالمشي لمسافات طويلة في الريف وكذلك بالجولات مع المرشدين في الجبال. Featuring an outdoor swimming pool in the garden, this guest house is set amongst olive trees and fruit trees. 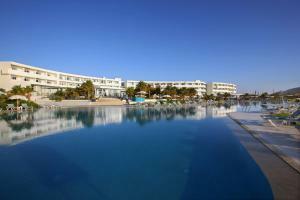 Essaouira is 12.4 miles away and camel rides can be arranged on site. 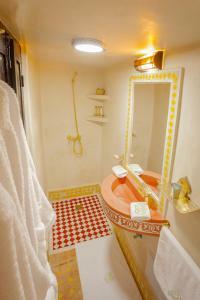 Each guest room has a private bathroom decorated with Tadelakt. 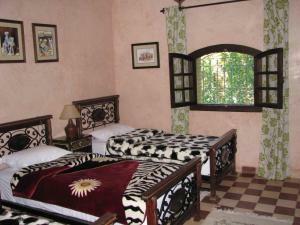 All of the rooms have a Berber-style decoration, and some offer a view of the garden. 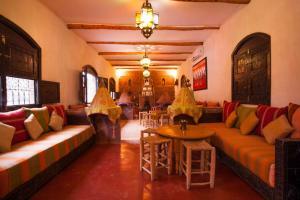 Moroccan dishes using organic produce are served in the dining room at Riad Douar Des Oliviers. 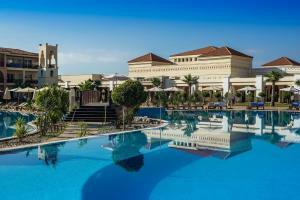 You can enjoy mint tea beside the pool, and breakfast is prepared every morning. 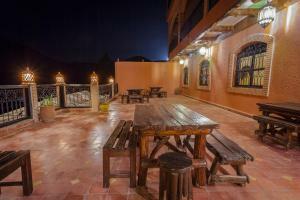 You can use the free Wi-Fi while relaxing on the patio, which features a fireplace. Possible activities in the area include horse riding and cycling. 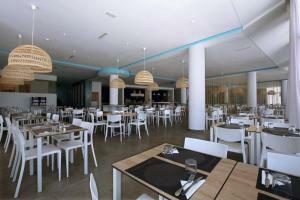 Mogador Airport is located 13 miles from the riad and parking is free on site. يقع بيت الضيافة هذا وسط أشجار الزيتون والفاكهة ويحتوي على مسبح في الهواء الطلق في الحديقة. وتقع مدينة الصويرة على بعد 20 كم ويمكن ترتيب أنشطة ركوب الجمال في الموقع.تحتوي جميع الغرف على حمام خاص مزين بالتدلاكت. كما تتميز جميع الغرف بزخرفة على الطراز البربري وتطل على الحديقة.يتم تقديم الأطباق المغربية باستخدام المنتجات العضوية في غرفة تناول الطعام في Riad Douar Des Oliviers. ويمكن الاستمتاع بالشاي بالنعناع بجانب المسبح، حيث يتم إعداد الإفطار كل صباح.يمكن استخدام خدمة الواي فاي المجانية أثناء الاسترخاء على الفناء، والذي يحتوي على مدفأة. وتشمل الأنشطة الممكنة في المنطقة ركوب الخيل وركوب الدراجات.يقع مطار موكادور على بعد 21 كم من الرياض ويتوفر موقف مجاني للسيارات في الموقع. Offering a garden and a terrace with views of the Atlas Mountains, this authentic Moroccan guest house is located in Asni and features a traditional Berber décor and a hammam. The guest rooms at Auberge Tigmmi N'Tamazirte are simply decorated with tadelakt walls and tile flooring and include a private bathroom with a shower and free toiletries. 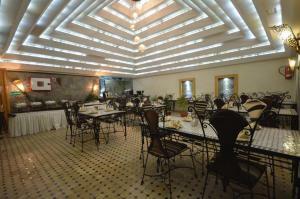 Berber cuisine can be enjoyed in the dining room and a continental breakfast is served daily. 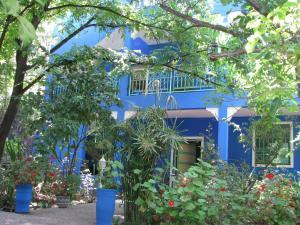 Pottery workshops are organised on site and the guest house can help arrange excursions in the area. Free private parking is possible and airport transfers are available upon request. 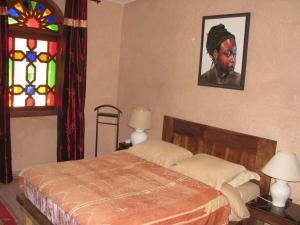 The guest house is a 40 minute drive from central Marrakech and 39 km from Aghmat. Offering a garden and a terrace with views of the Atlas Mountains, this authentic Moroccan guest house is located in Asni and features a traditional Berber décor and a hammam. The guest rooms at Auberge Tigmmi N'Tamazirte are simply decorated with tadelakt walls and tile flooring and include a private bathroom with a shower and free toiletries. 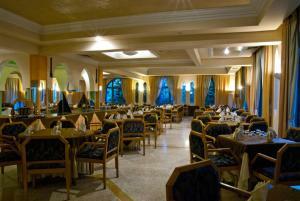 Berber cuisine can be enjoyed in the dining room and a continental breakfast is served daily. Pottery workshops are organised on site and the guest house can help arrange excursions in the area. Free private parking is possible and airport transfers are available upon request. 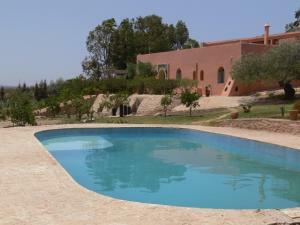 The guest house is a 2-hour drive from Marrakech and 39 km from Aghmat. 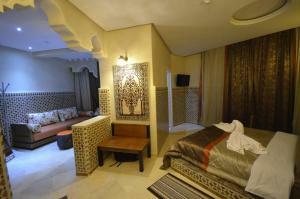 The Riad Marlinea is located in the coastal town of Salé, within the medina and close to the old markets and beaches. 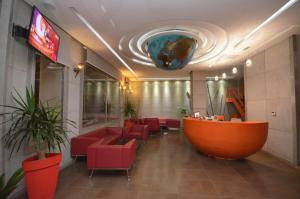 It offers free Wi-Fi internet access. 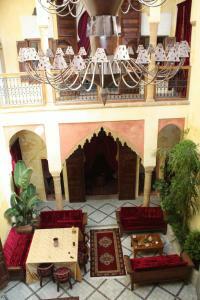 The guest rooms and suites are built around the Riad?s inner courtyard. 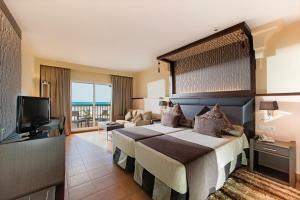 They feature air conditioning and en suite facilities. Riad Marlinea provides a full buffet breakfast and guests can enjoy Moroccan specialities in the hotel?s restaurant and bar. 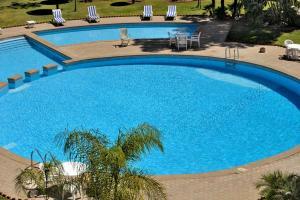 Additional facilities include a solarium, a hot tub and car rental service. Private parking is available nearby for guests exploring the region by car. Salé Airport is 8 km away. يقع Riad Marlinea في بلدة Salé الساحلية داخل المدينة القديمة وبالقرب من الأسواق القديمة والشواطئ، ويوفر خدمة الواي فاي المجانية.تتوزع غرف الضيوف والأجنحة حول ساحة الفناء الداخلي لهذا المنزل المغربي التقليدي، ويحتوي جناحين من الأجنحة على حوض استحمام ساخن، وتحتوي على تكييف ومرافق حمام داخلي.يقدم Riad Marlinea إفطار كامل، ويمكن للضيوف الاستمتاع بالأطباق المغربية في مطعم وبار الفندق.تتضمن المرافق الإضافية مقصورة التشمس الاصطناعي وخدمة تأجير السيارات.يتوفر موقف خاص للسيارات في مكان قريب للضيوف الذين يكتشفون المنطقة بواسطة سياراتهم، ويقع مطار Salé على بُعد 8 كم.